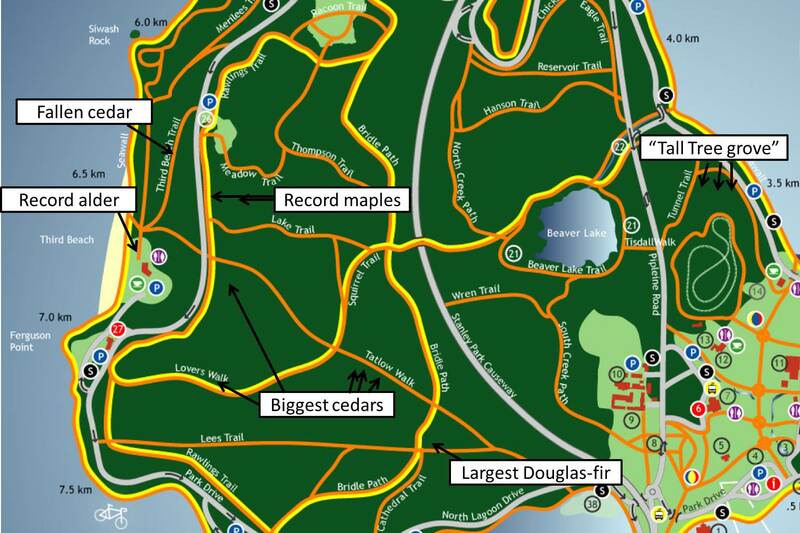 Overview and hiking guide to the old-growth forests of Stanley Park. Within Stanley Park discover 256 ha of coastal temperate forest, all of it brimming with past human uses, the legacies of catastrophic windstorms and ongoing nature regeneration. Photo by IS 2011. Stanley Park is the most visited and certainly the most cherished of Vancouver’s entire park system. However, most of the park’s 8 million annual visitors (Vancouver Park Board 2007) stick to the main attractions, and relatively few venture into the parks interior forests. Hidden inside the park’s canopy cloak are some of the most remarkable trees in Vancouver, let alone the entire province. There are groves to discover with monumental ancient cedars and towering Douglas-fir. In fact, record-sized specimens for some native tree species are concealed within this park, within ear shot of the busy downtown centre. In this guide, you will find directions to visit the largest trees of several species, and if you read on, you can acquaint yourself with stories surrounding the park’s interior forest ecology and natural history. I’ve created this page to help build readers sense of place, familiarity, and overall appreciation of Stanley Park. I do hope you enjoy. It is quite easy to visit the parks largest trees, including the thickest western red cedar at over 5m (16.5′) diameter at breast height (dbh) and the tallest Douglas-fir at 63m (208′) tall. These productive conifer forests grow higher than mid-size skyscrapers in the adjacent city centre. Perhaps, more significant than the parks coniferous giants are the parks native maples and alders. The park contains the largest recorded big leaf maple tree in BC (Acer macrophyllum), which is perhaps the largest Maple tree in Canada! (Unless this Ontario sugar maple is larger). At third beach, grows the largest recorded red alder in BC, though pruning may have reduced it to now being the second largest recorded red alder in BC. Surprisingly, the parks incredible big trees are often overlooked due to the plethora of other park recreational activities and the popular shoreline. Here, I am in the process of writing directions for exploring inside the park’s forested areas to see the largest specimens of a variety of native tree species found within the park. One of my goal’s is to update measurements of the parks largest trees, which have not been re-measured since originally measured in 1987 by Randy Stoltmann (1987). During my measurements, I’ve uncovered recent dramatic changes. Since 1987, the park’s largest red-cedar and tallest Douglas-fir have blown over. The tallest trees appear to now be relatively young second-growth Douglas-fir to the south of Beaver Lake. Although it is believed that most of the tallest Douglas-firs in the park were logged by the 1930’s (Stoltmann 1987) the old-growth forests are still a vital legacy of Vancouver’s natural history. Due to the park’s high traffic and the obvious heritage value, please tread respectfully and, if you are in a group, considering keeping some distance from the most ancient trees to minimize trampling of their roots. Two impressive Douglas-fir specimens are easy finds, just a few minutes from the bus loop. The southern most of the two is an astounding specimen, which showcases in plain site the straight growth of Douglas-fir, which combined with its strength make it one of the most preferred timber species in North America. This giant provides a mysterious insight into just how tall a Douglas-fir can grow. In fact, its possible that this is the tree that is sometimes rumoured to have been above 90m in height near the park’s entrance. This tree is now broken off at around 55.5m, at which point it is still very thick and straight. A live branch is its highest point. The tree 50m to the north of it is less impressive as a specimen tree, but is still 51.1 m tall with a 1.9m dbh trunk. These tree may grow taller yet, but how could we ever know how tall they once grew…. ? The 55.5 m tall Doulgas-fir near the Stanley Park Pavillion and Bus Loop. Well… lets speculate its former height! So, because this tree is well centred at the historical entrance of Stanley park it makes a clear appearance in numerous historical photos. I’m quite confident that our tree is seen below after having inspected from numerous angles (including Google Earth) of how the tree lines up with the entrance, the rowing club building, and the Stanley Park Pavillion. In 1921, it appeared to have had a mostly live and intact top, see below. However, by 1936, at the time when the causeway was built, the top portion of its crown was sheared off (I would guess it was cut off for safety reasons). See below. 1936 photo of the Stanley Park Entrance shows tree has broken off since 1921. Photo from City of Vancouver Archives. I’ve made several assumptions here: 1) that the trees in these photos are the same, 2) that I’ve lined up the trees properly based on conspicuous branching features, and 3) that I’ve accurately estimated the height of the base of the tree. I feel pretty good about assumptions 1 and 2, but not great about 3. Anyway, for now, if the tree as seen in 1936 is the same height as it is today (55.5 m), than the tree was a true giant at around 77.7m in height back in 1921 (and other photos show that it was still intact up to 1928). What I need to do now is to get additional modern photos to check if the 1931 height matches today’s height. Why does this matter? Well, I’ve heard that the tallest tree in the park once grew at the entrance, which simply must have been this tree in the historical photos unless it was cut down prior to 1921. Here is an opportunity to investigate the tree’s height, and potentially either support or refute the claim that this historic tree was over 90m in height. The Tall Tree Grove is a collection of large diameter trees once recorded to be the tallest in the park by Stoltmann (1987). The second tallest tree in this grove when measured in 1987 was a 72.5m dead tree known as the ‘Eagle Tree.’ This tree is frequently perched on by bald eagles, which carefully select their favourite perch trees. By my measure in 2016, the Eagle tree has lost ~9m of height and is now 63.5m tall with a dbh of 2.1m. A piece of broken crown, several meters in length, lay at its base, probably since at least ten years ago. Caution: there are also piles of bark that provide a warning that this is not a safe place to linger due to overhead debris hazards. The Eagle Tree is best enjoyed from Pipeline road, which gives a clear view. Directly beside Pipeline Road is a healthy Douglas-fir about 56 m in height. In 1987, another tree immediately uphill to the north had a dead top at 76.5m in height. This dead tree was nearly the tallest in the park, but by 2016, the tree has collapsed and is no longer visible. These dramatic losses of height in the grove appear to be due to wind, which has battered and thinned the canopy. In 2016, I observed a very large hemlock and red-cedar recently downed at the centre of the grove. Nonetheless, these old trees have more character than nearly any other grove around Vancouver. They will likely not grow any taller, but they will grow wider yet, and some of the giants may live another century or more. The wind has acted together with the old age of the trees to knock some trees down and sheer the tops of of others. The wind is a natural disturbance agent, which I discuss in section 3 of this guide. There are still several very large, easy to view Douglas-fir within the tall tree grove, including several of the widest-diameter Douglas-fir in the park. Find the widest Douglas-fir in the tall tree grove by heading northwest and uphill along ‘Tunnel’ path watching for the big trees off to the right side of the trail. The first tree you see (the eastern most large tree in the tall tree grove), is 2.2m dbh and 52.5m tall. It is somewhat difficult to access due to large fallen logs obstructing the way and a formidable entanglement of invasive (and very prickly!) Himalayan blackberry (2016). I suggest continuing slightly further on tunnel trail and to the right you cannot miss a very large diameter Douglas-fir tree only about 15 m off from the path. This tree can be easily visited and I encourage you to because it’s a giant at 2.4m dbh —one of the thickest Douglas-fir in the park —and is a beautiful specimen to observe the remarkably thick and furrowed bark of veteran Douglas-fir trees. Beside this are a very tall hemlock and two additional large Douglas-firs to your left. One of the Douglas-fir to your left has a dead and broken top measuring at ~55m. Head a little bit further down Tunnel until you’re almost at Pipeline Road and note the very large Douglas-fir stump on the left that is cut about 2.5 m above ground. This stump is nearly as thick as those remaining even without its bark. In fact, there are very large Douglas-fir stumps throughout the Tall Tree Grove and on Tunnel Trail heading east towards Lumberman’s Arch. All forests are faced with various types of disturbance —there are fires that raze, insects that defoliate, and windstorms that topple trees. These different disturbances can kill trees but they also shape the forests beneficially for other critters that need dead trees to nest or logs on the ground for shelter. Disturbances come in varying intensities and leave their signatures in the form of legacies such as fallen logs and dead rotting stumps. These legacies provide us with clues for investigating a forest’s history. Old-growth forests, such as those found within Stanley Park have long and dynamic histories to share. In the humid coastal margins of Vancouver we find a type of forest classified as coastal temperate rainforest. These forests are dominated by long-lived coniferous tree species. Forest fires are extremely rare in this forest type and disturbances are usually low in severity windstorms that uproot trees and knock out small clearings in the forest canopy. In an old-growth forest you’ll notice that the overhead canopy is quite open with many gaps between the trees that allow sunlight to enter the forest. Understory plants grow more vigorously in the enhanced light under canopy gaps and conifer seedlings are able to establish, to one day grow tall and establish a spot in the canopy high above. The wind sometimes breaks trees clean in half leaving tall sections of trees that remain dead but still standing, which begin to decay and provide foraging habitat for pileated woodpeckers. When wind knocks trees to the ground, sometimes the logs stack on top of each other creating a matrix of logs crisscrossing the forest floor. The influence of windstorms on forest development is written into the unique identity of old-growth forests, and there are few places where you can see this as clearly as in Stanley Park. A pileated woodpecker foraging for insects in a standing but dead tree in Stanley Park. 2011 by IS. Figure above shows a gallery of historical aerial photos 1946 – 2015, which highlight changes in the parks forests caused by wind. The final slide summarizes the extent of damage caused by the 2006 windstorm and Hurricane Freda in 1962. Images 1946-2008 are extracted with permission from the MSc thesis of Mike Buffo (2010), and originally come from UBC Geographic Information Centre library. The 2015 photo comes from Google Earth. Occasionally, destructive windstorms occur in our local coastal temperate forests. In Stanley Park, damaging windstorms in 1934, 1962 and most recently in 2006 arrived and knocked over huge swaths of forest. Wind has been a major driving influence on the park’s forest ecology, but the 2006 windstorm was more severe than any other to hit the park in the past 100 years. The 2006 windstorm ravaged 80ha of forest, causing severe damage to a full 30ha of forest. Severe damage is defined here as >60% of the canopy being affected —rarely does wind knock over forest stands entirely. An area hit hard by the 2006 windstorm seen a few years later in 2012. Although the damage here was severe, note that many trees are still standing. In the huge gap created by wind young saplings now grow. What will this forest look like in 20 years? How about 200 years? Both Hurricane Freda in 1962 and the 2006 windstorm damaged many large trees and left legacies in the form of young recovering stands, which are sometimes different in species composition and structure from the old-growth forest. Relative to the old-growth, the stands recovering from Freda are either now dominated by deciduous trees (i.e. to the south of Beaver Lake) or are young conifer stands. Many trees of similar size and age characterize the structure of these young stands. As they grow upwards they strongly compete for light and they eventually will block the light desired by understory plants. Meanwhile, the stands recovering from the 2006 windstorm have small conifer saplings (many of which were planted). The response of the forest to these and previous major wind disturbances is also largely influenced by the human response as detailed in this fantastic history of Stanley Park. Although wind storms and other disturbances that hit Stanley Park are natural agents that contribute to making the forest what we see today, they can be destructive to the park’s great heritage trees. For example, the 2006 windstorm damaged the Hollow Tree, Vancouver’s most cherished tree, triggering a major debate (as captured in this film) on wether to restore it or cut it down. In the next section, I share my startlingly discovery that the tallest old-growth trees appear to have fallen in the past three decades. In the ongoing process of forest renewal, the tallest trees are now the result of saplings that began to grow when Vancouver was just a small growing village. Lately I’ve been employing the latest technology and help from colleagues to systematically search the tallest trees in our region. Here is a video that explains the method of using lidar data, a sophisticated laser scanning of the forest from airplane, to find the tallest trees. With help from Olli Pihlapuro of the University of Eastern Finland we processed free lidar data from Open Data Vancouver. The processed data can be downloaded here for viewing on GIS software: (www.mikrokuvio.fi/Stanley_pitfree_20cm.zip). Below is a map made using Lidar technology showing the height of the canopy across Stanley park. The two boxes below compare on the right the tall tree grove (the former tallest trees in Stanley Park), with on the left: a young grove recovering from fire that swept through Stanley Park in the mid 1880’s. We marked the tallest canopy points in Stanley Park and then I went out and ground-truthed the tallest heights with Flora Hugon. The heights that I present in the map above are averages taken from multiple measurements, which generally includes a lidar estimate, and at least one ground estimate done using a laser rangefinder. Our main discovery, which made headlines, is that the tallest tree within the municipal limits of City of Vancouver is suddenly now a skinny Douglas-fir with an estimated height of 63.6m (210 feet). This tree has surpassed other old-growth in Stanley park. It grows in a dense stand of second-growth to the south of Beaver Lake, pictured below. Incredibly, this stand is believed to have originated following fires that occurred during settlement in the 1880’s. I’ve thus named this stand the ‘Second Chance Grove’ as it provides a testament to the outstanding character of our local forests and indicates, most importantly, that we may get a second chance with nature. To find the tallest tree walk from Beaver Lake along South Creek Trail to about 50m past the junction with Wren Trail. Look out for a large stump on the right, and at that point the Second Chance tree is growing about 5m off trail to your left at the edge of a small canopy gap. While the tree itself, is not as charismatic as the old-growth lets keep our eye on it because within a decade or two it might easily reach 70m in height, or greater. Example of how lidar works. A laser scans the forest from above and reflects off objects it encounters. Based on the return times, exact locations of objects in space are identified. The difference between ground hits and tree hits is used to estimate the canopy height. To read more about general landscape changes and for before and after photos see this interesting post, or this before and after set of photos by Andrew Farris. For a narrative of how people have responded to the wind disturbances read this short, illustrative story by Forbidden Vancouver. Bakewell, David R. “Forest maintenance program for Stanley Park.”Commissioned by Vancouver Board of Parks and Recreation (1980). Buffo, Mike A. Meeting management goals in an urban forest: vegetation dynamics and prescriptions in Stanley Park.” Electronic Theses and Dissertations (ETDs) 2008+ (2010). For now this is just playing around a bit, but it’s definitely a longterm interest of mine to figure out methods to estimate historical tree heights. I’ve got a few ideas kicking around how to improve the estimate of this tree’s height yet! Great research and I look forward to further instalments. I’m curious though about how you use the term ‘Old Growth’ to compare mature Stanley Park forest to the recovering stands affected by wind storms. Is mature Stanley Park forest accurately termed Old Growth? Clearly the bulk of trees are not many hundreds of years with stature such as is seen in Pacific Rim National Park on the island. I’m sure you will touch on this in your forthcoming part about legacies of logging, but I would love to know in what years logging occurred and how accurately we can date the age of remaining stands of trees. Thanks! Thanks Jonathan. Glad your enjoying. The term Old-growth often generates confusion. I use it to describe a structural stage of forest stand dynamics, defined by the presence of several structural attributes, such as relatively large trees, large standing dead trees, large logs on the ground, and an open, stratified canopy. In general, forest structure is the primary forest stand characteristic used to define old-growth. Researchers in Wash and Oregon have taken that further to develop indexes of ‘old-growthness’ based on structural characteristics. The BC Gov defines old-growth on the coast as >250 years for management purposes, which seems awfully rigid and problematic. As a forest ecologist, I try to avoid that. It seems that many Vancouverites are unaware that Stanley Park (and many areas around Vancouver) still contain old-growth forest. None of Stanley Park is pristine, but much is old-growth, and some contains trees >600 years old. Overall, the park contains 256 ha of forest, within which you will find a variety of forest stand types of differing age, tree species composition and structural stages. Figure 3-24 in Buffo (2010) maps the park by forest stand types, and concludes that nearly half of the forest area is classified as “old-mature’ (>100 years). I’ll look into this more (and later update the blog) but I’d estimate that 20-30% of the park would be considered old-growth according to the above definition. I really enjoy your posts on the big trees around Vancouver. I’m curious, do you have any idea how old the ancient Douglas Fir is on Lees Trail in Stanley Park? There’s also a big Western Red Cedar I regularly marvel at on Lovers Trail about a 100 yards from the roadway, any ideas how old it is? Hey, great question! I’m not sure, and I’ll look into this a bit more. I seem to recall reading somewhere… My educated speculation is that the huge Douglas-fir on Lees trail is minimum 350 years old, more likely somewhere in the 400-525 range. The old cedar on Lovers trail is incredible; likely older than 400, less than 700…. Pretty wide ranges, but I’m not an expert in tree ages, and I know trunk size is not a great indicator with old-growth trees. Hi Bill. Very pleased you’ve come across my blog. Whether or not the big trees of Stanley park should be made public is an interesting question, I pondered for several years. I share your concerns of possible visitation impacts. The fact that increased visitation and installation of amenities (ie fencing) might result in large trees requiring increased safety pruning is an interesting additional dimension to consider. Ultimately, I’m convinced that experiential interactions with big trees is a powerful step toward building awareness of forest ecology and management issues across the province. This is particularly important in Vancouver where half the province’s voting popualation dwells. I’m very curious, though, are discussion is yet on the table for establishing fences or other measures to limit impact for the most remarkable trees? And, are measures such as mapping or special work zones in place so that managers and operators know to avoid potential impact to big trees? Thank you very much for the research, and info on Stanley Park. Very helpful!